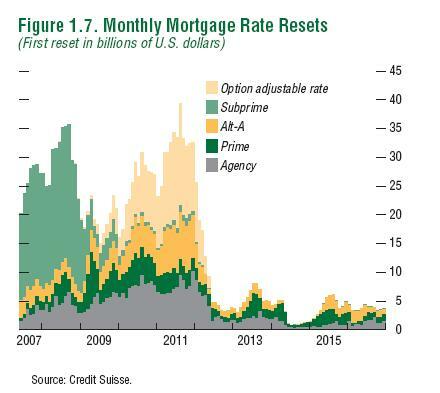 Loan Modifications, touted as one solution to the housing crisis, haven’t lived up to their promise. For one thing, they seem quite difficult to get. 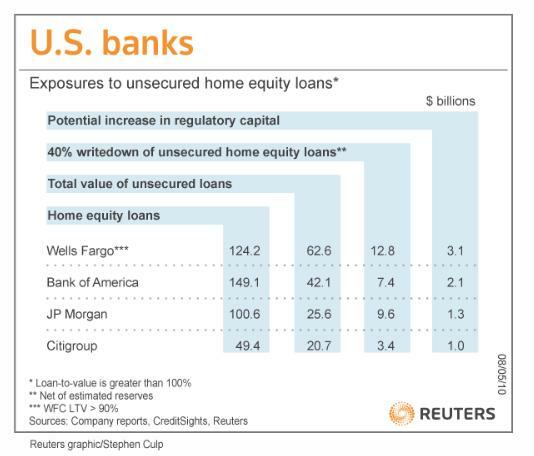 A cbsnews article suggests this is because of potential problems with the banks’ balance sheet causing by lurking bad home equity loans. The theory goes, if the banks recognized the true value of these loans, the writedowns to their balance sheets would be in the billions, causing losses and a possible need to increase the amount of regulatory capital they have on hand. For those of you that have been following the financial crisis, you’ll know there has been efforts to force the banks to increase the amount of cash they have to offset the amount of money they have lent out in loans. This is what is meant by regulatory capital. The article shows a Reuters image I’ve captured here. This raised some questions in my mind. Why is this impacting requested loan modifications where there is no second lien present? I can understand the reluctance to modify the second lien so that it loses most of it’s value, but I don’t think this explain the many loan modifications that are not getting through as there is no second lien or home equity loan. What the heck is a “unsecured home equity loan”? A home equity loan by definition is secured by real estate. Otherwise it is just a personal loan. So I did some research. Apparently, a home equity loan becomes “unsecured” when the there is no equity to support it (it’s an underwater loan). If this is the explanation I think the “40% writedown” may be too conservative. In distress situations, the second lien is usually wiped out almost completely. The Obama administration has not been happy with the lenders’ effort to help property owners in the housing crisis. For the more than 6.5 million property owners currently late on their mortgage only 170,000 loan modifications have been completed. Under increasing government pressure, Bank Of America launched a new program to erase as much as 30% off the principal in underwater home loans. The program should be available sometime in May, and before you ask, yes it is only available to homeowners with principal residences. The enhancements to the National Homeownership Retention Program (as they call it) are coming soon according to their web site. Bank of America has not been my favorite bank, but I am cheered to see a major bank lead the way towards measures that must be taken. Both property owners and the banks are going to have to compromise and meet somewhere in the middle for us to get out of this mess. Troubled homeowners who have gone through a foreclosure or a short sale may have a lurking problem that could cause them problems years down the road. Even though you think you may have put a bad chapter in your life behind you, the lender can still come after you with a deficiency judgment. A deficiency judgment is when the lender sues you for the difference between the loan amount and the amount they (the lender) realized when the house was sold. Whether it was through a short sale or sold as a bank owned property may not matter. Yahoo finance published an article that illustrates the problem with several examples. In one, a borrower even signed a document at a short sale closing that gave the lender permission to come after him. If you are in a short sale, make sure you get agreement (in writing) that the lender will not pursue a deficiency judgment against you. If you have lost a house through foreclosure, whether the lender can come after you will depend on the state the house was in. If you are in a recourse state, the lender can pursue a deficiency judgment against you. Per The New Republic blog, the non recourse states are Alaska, Arizona, California, Iowa, Minnesota, Montana, North Carolina, North Dakota, Oregon, Washington and Wisconsin. However, even iin these states, a lender may have recourse with second liens and refinanced loans. Regardless, consulting an attorney is needed for advice on your specific situation.